Demetra offer students instruction in astrology at her annual in-person Hellenistic astrology retreats in Oregon. You can also study with Demetra through her many books and online classes. 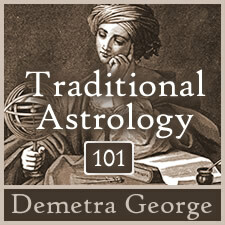 Study Traditional Astrology with Demetra George via live and pre-recorded webinars. Each webinar presents a special topic in detail. Study astrology from the convenience of your own home, and learn at your own pace. In this first module Traditional Astrology 101, you'll learn the building blocks of traditional astrology. In this twelve-part series, Demetra George provides an in-depth discussion on each the twelve houses. In one of the most comprehensive teachings on the astrological houses, Demetra traces the meaning of each house from past to present, exploring traditional meanings while illuminating their evolving meaning through the present modern interpretations.. This extensive introduction serves as a training manual for the study and practice of Hellenistic astrology. It provides the complete foundations and detailed dynamics of ancient chart-reading techniques. Each technique is richly illustrated with diagrams, example charts, and practical exercises. The first volume of two, this book focuses on assessing planetary condition.